The Colby College Men’s lacrosse team has decided to construct a lax rebounding wall at Colby College in memory of their teammate and our son, Derrik Flahive. The cost of Derrik’s wall is approximately $40,000. It will be 16′ by 40′ and double sided. 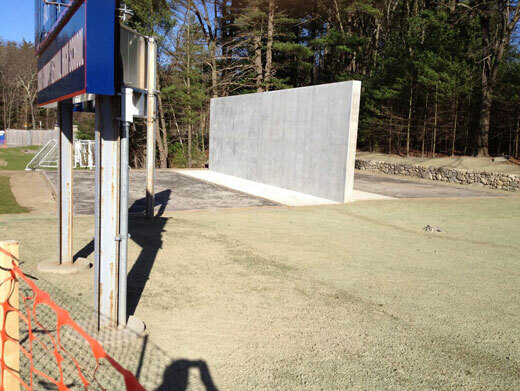 The college and Coach Domingos have determined an exact location for the wall which is immediately adjacent to the Alfond lacrosse field and the team has spoken to a construction company. The team’s focus now needs to turn to fund raising. The team needs to raise the money by May 30th, 2012 in order to build this tribute as quickly as possible. To date approximately $4,500 has been raised from various sources. Those associated with the Colby lacrosse family have asked us to send a note along to his Colorado friends and team mates as well. All gifts are tax deductible and you will receive a gift acknowledgement from the college. If you have questions or problems donating, please contact Matt Mullen in the Alumni office (mrmullen@colby.edu and his phone is 1-207-859-4322). He is our “point person” at Colby and he can answer any questions related to the Flahive Five fund. When making your contribution, please also inquire about Corporate matching, if you feel this may be a possibility. Thank you so much for your support at this important time. This week, Coach Domingos is meeting with the lacrosse team to discuss fund raising strategies. Each player is responsible for raising $300 for the Flahive Five fund. Matt will be contacting the Colby women’s lacrosse team to ask if they would like to participate in the Flahive Five campaign as well. Finally, the team will draft a letter to Colby lacrosse alumni and past parents inviting their participation. Our Captains are seeking an interview with the Colby Echo, to help publicize this campaign through the school newspaper.